Spring reminds many of us of baseball season. One classic baseball film, A Field of Dreams utilizes the sentinel line “If you build it, he will come.” Taking the chance to build something and trusting others will follow, requires many things including conviction that you are doing the right thing, willingness to take risk, and perseverance. Thirty-six years ago, the Board of Pharmacy Specialties (BPS) conducted the first examination and recognized the first group of board-certified nuclear pharmacists. The growth was slow but steady in the early years; however, in recent years the growth has increased dramatically. 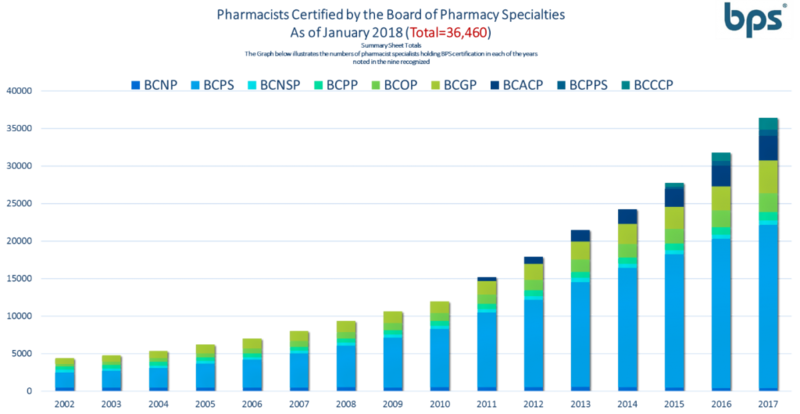 The total number of board-certified pharmacists is over 36,000! Thirty-six years after the administration of the first exam, greater than ten percent of licensed pharmacists currently are board certified by BPS. The first offering of the pharmacotherapy examination was in 1991. In 1997, I studied with four other pharmacists, once a week for most of the year and we all successfully passed the pharmacotherapy examination, which is still a highlight of my career. When I received my certificate, I realized that I was part of the group that pushed the number of board-certified pharmacotherapy specialists (BCPS) nationwide beyond 1,000. Today, there are more than 21,000 specialists holding this credential. In 2011, the first examination in ambulatory care pharmacy was administered and pharmacist specialists who successfully passed the examination were designated board-certified ambulatory care pharmacists (BCACP). In 2012, just the second year of existence, the total number of BCACPs was 1,000. Specialization in ambulatory care pharmacy was built and the pharmacy profession embraced it. Today, just seven years after the first examination, the profession boasts more than 3,000 board-certified ambulatory care pharmacists. Tremendous perseverance of many individuals who believed board certification of pharmacists was an important process for the profession to achieve higher aspirations has resulted in not only recognition nationally but also internationally. Today, nine countries outside the U.S. each have more than one hundred board-certified pharmacists. Two countries, Egypt and Canada, have more than 900 board-certified pharmacists. The specialties utilized in various countries is remarkable. 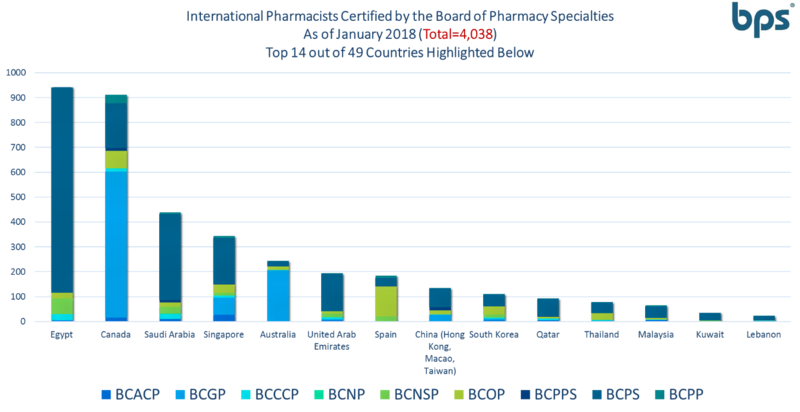 In several countries, the majority of board-certified pharmacists hold the BCPS certification (as in the US). However, internationally the board-certified geriatric pharmacist (BCGP) credential is the most common certification in Canada and Australia. Spain interestingly has a majority of board-certified oncology specialists (BCOP). Pharmacists from across the globe utilize the BPS certification system. Currently, BPS recognizes 12 specialties in the pharmacy profession. Closer review of the current specialty totals reveals eight certifications with over 500 board-certified pharmacists. Two of these certifications, infectious diseases and cardiology, will deliver their first ever examination this Fall, and the newly approved certification in compounded sterile preparations will likely offer its first examination in the Fall of 2019. This allows many types of specialists to demonstrate their knowledge and skills and obtain recognition for their specialized abilities. More than 40 years ago, visionaries committed to a path of credentialing individual pharmacists and started a process to begin the board certification of pharmacists. Innumerable contributions helped to build the credentialing processes utilized by BPS. The building process has involved many volunteers who write items, review items, construct examinations, determine examination pass-points, and maintain the standards of certification. Thank “YOU” to everyone who helped “BUILD” the BPS pharmacist board certification process and through this work build the profession’s capacity to provide advanced patient care services.